Last weekend was a bank holiday weekend here in the UK - the only holiday we have between the bank holiday Monday at the end of May and Christmas. Most people go away but I like to stay put and use the precious extra day either for lying in the sun in my garden (no chance of that this weekend, more like lying in the rain) or sewing. So given that the weather was disappointing (I really would like to use another word here !) I spend it sewing. 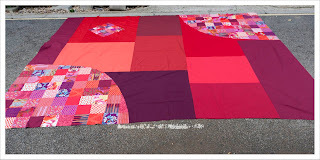 The 'Very Berry' quilt commission I started here several weeks ago for my friends Mica and Claire had to move forward. 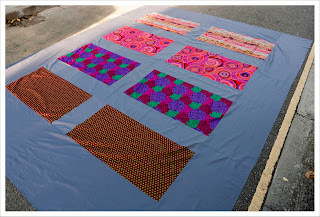 You may remember that it is a super sized quilt at 2.5 x 3.2 m that is 98 x 126 inches and so far I had only finished the first third of the top. My goal was to get the whole thing basted. I apologize upfront for the poor quality photos but I could not find a wall high enough to hang the pieces nor a wall high enough to stand on to properly photography the quilt from atop. In addition the sun kept peeking out of the clouds when I least wanted it. On Sunday I pieced the back with some lovely Kaffe Fassett prints and lots and lots of Kona coal. I wanted to keep the back in a more neutral colour but with just a bit of red. Piecing it made me feel like being in 'Gulliver Travels'. If you look at the back you see that it really is just rectangles with some sashing in Kona coal but we are talking series measurements here. The rectangles are each 36 x 20 inches and the sashing in proportion around it. I wrestled with it for hours in my small living room basting it in 3 stages. That actually worked surprisingly well although I could only unroll 2 meters at a time. Love your quilt. Can't wait to see the quilting done! Wow, I can't believe you do not have any holidays until December. Our Labor Day is this coming Monday. Then we have Veteran's Day Nov. 11 and Thanksgiving the last Thursday and Friday of November. Well, I'm glad you had a good day finishing your quilt. 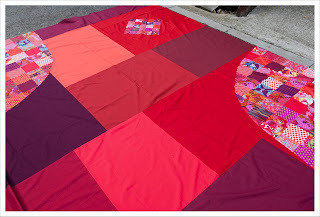 It will be interesting to see how you quilt it - bit of a ruby monster (in size)! Are you ready to wrestle it into submission? It does look stunning now but once it is quilted I reckon it will really shine! That is a stunning quilt. It's absolutely gorgeous! I can't wait to see how you quilt it! Its utterly gorgeous, but I've no idea how one earth you're coping with the size of it! Good luck! Whoa!! That's H U G E!! You've done a great job, love those bold colours of the back, great piecing to the front. Good luck wrestling that through the sewing machine, it'd be like training for the Olympics! Are you quilting it on a regular sewing machine? Longarm? She is a BEAST!! What a knockout beast though!!!!! This has got to be the best quilt I have seen in a long time! 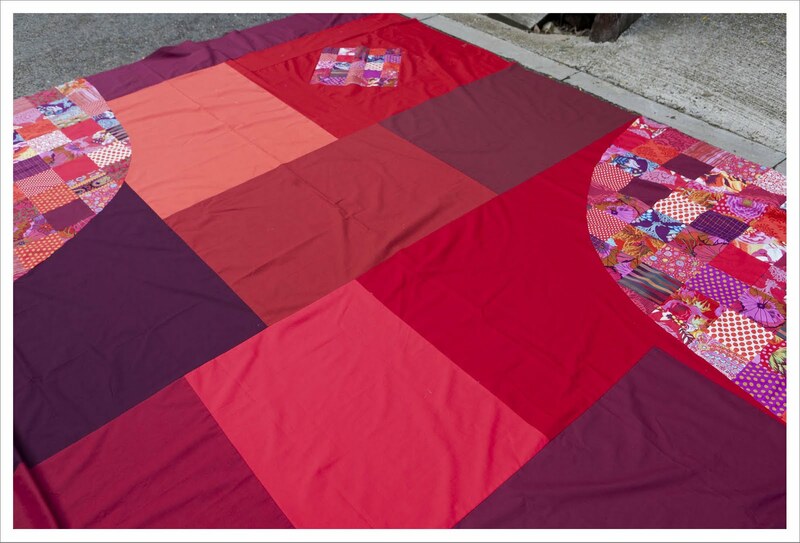 I remember reading about this quilt from the beginning and I have always loved it, still do. I am so glad you are back to it, it just gets better with each step!